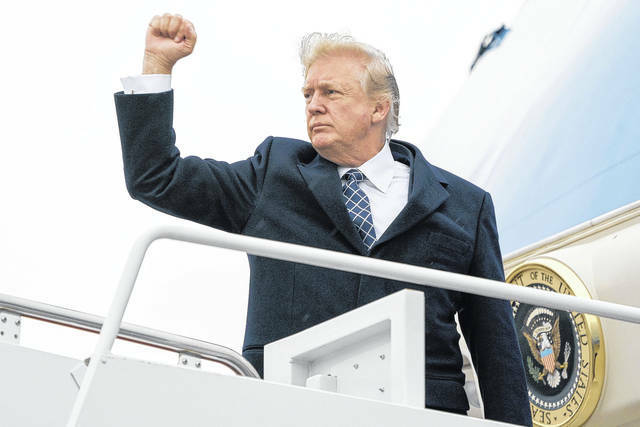 President Donald Trump gestures as he boards Air Force One at Andrews Air Force Base, Md., Friday, Jan. 12, 2018, to travel to Palm Beach International Airport in West Palm Beach, Fla.
PASADENA, Calif. (AP) — Donald Trump ignored the stunning question at a White House appearance on Friday — “Mr. President, are you a racist?” — but there’s no getting around that more people in the media are willing to use that label. The president’s reference to African “s—hole” countries and reported resistance to more immigration from Haiti felt like a tipping point in the number of people willing to call Trump a racist, rather than say his words or actions exhibited racism.